Elle is an amateur documentary filmmaker. Charlotte is the self-proclaimed leader of the religious group, “The Movement for the Second Coming of Jesus Christ through the Seven Prophecies Which Must be Completed in Some Way Before the Evolution of Jesus Back into Man.” As Elle documents the rituals of Charlotte and her followers, she struggles to retain her sanity when she realizes that she may have accidentally joined a cult. Elle, an awkward and lonely amateur documentary filmmaker, begins vlogging about her experiences with Couchhoppers.com - a social networking website where travelers from around the world can connect to find places to stay. Through this website, she meets Charlotte, who merely requires that her boarding companion owns a pet cat. Elle arranges for Charlotte to stay with her and is relieved to find that she is much more likeable than her past guests. After quickly becoming friends, Charlotte reveals that she is the branch leader of a religious organization responsible for the second-coming of Jesus Christ. Initially, Elle is discouraged to learn that her new best friend is a “Jesus Freak." But wanting to make an amazing documentary, she decides that Charlotte and her organization would be an even better focus than what she had originally planned. So she agrees to accompany Charlotte to a group meeting for the organization, "The Movement for the Second Coming of Jesus Christ through the Seven Prophecies Which Must be Completed in Some Way Before the Evolution of Jesus Back into Man" (or the MSCJCTSPWMCSWBEJBM). There she meets the other local members of the group but is unable to gather any further information about their cause. Skeptical, but intrigued, she decides to become an official member of the organization. As Elle documents the rituals of Charlotte and her followers, she struggles to retain her sanity when she realizes that she may have accidentally joined a cult. 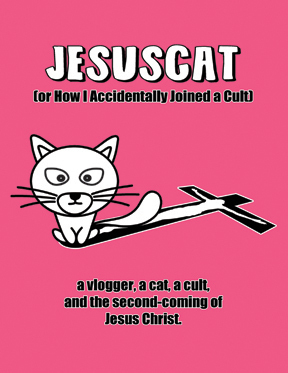 JesusCat (or How I Accidentally Joined a Cult) doesn’t technically have a director. Or a writer. Instead, we consider ourselves “co-creators.” Yes, we funded this project out of our own pockets, we organized production and told the other actors what we envisioned, and we co-wrote a story outline as a structural skeleton of our narrative idea. But the outcome of this project, being improvisational, is really thanks to our amazing ensemble cast. And to be honest, most of the ideas or bits of dialogue we had pre-planned were ultimately cut from the final product because they simply weren’t as funny as the randomness that came out on the spot while the camera was rolling. We officially began developing this project in early 2011 - brainstorming ideas over lunch at our local Denny’s, the meeting place of true independent filmmakers. We had previously co-produced the stage play, Twenty-Two, which was a dark and depressing glance into cocaine addiction and realized, “We need to do some comedy.” And with Shaina’s signature youthful, child-like appearance, we realized she needed to play a cult leader. Obviously. Julia had remembered a time from her youth when she was somewhat obsessed with the subject of real cults and had written a letter to Charles Manson in prison, expressing interest in developing a movie about his life as a cult leader. However, once she received a written response from him, she realized, “Wow! He really is crazy!” and halted her pursuit. So, in a way, JesusCat is now finally fulfilling her previous endeavor, just in a fictional, and therefore less creepy way. Our primary goals with the making of JesusCat were to have fun, produce leading roles for ourselves as actors that would never be available to us otherwise, and create a social satire story that represents something serious in society today. We believe that sometimes the best way to bring awareness to a real issue is to poke fun at it. Cults are an extremely controversial topic because their definition is so ambiguous. People may disagree on when the line is crossed from a healthy religious or spiritual support group to a manipulative and abusive ideological organization. And cults do not generally make the public news until something drastic like murder, suicide, or crime occurs. However, according to the Cult Clinic [www.cultclinic.org], a non-profit organization in New York assisting former cult members, an estimated five to seven million Americans have been involved in cults and there are approximately 180,000 new recruits into cults each year. 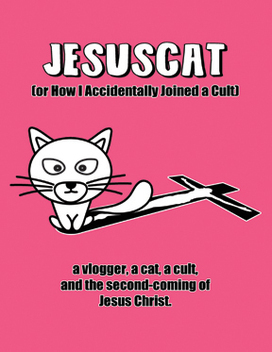 As much as JesusCat pokes fun at a fictional cult, we hope it does not cause our audience to forget about the seriousness of the cult movement today. But for now, we invite you to witness a humorous series of events, and maybe even renew your faith in the impossible. Production Notes: "JesusCat (or How We Created a Movie)"
JesusCat (or How I Accidentally Joined a Cult) was shot in HD, entirely on location in Los Angeles, California. Principal photography began in September 2011. Our official wrap date was November 1, 2012. Production was stretched out for so long for two primary reasons: 1) Due to the improvisation, we needed to edit a large majority of the film in order to determine where the gaps in the storyline occurred before continuing to the last few shoot days, and 2) Everyone was working on a volunteer basis, so scheduling the cast together around their day jobs and other projects was a continuous challenge. We captured over 12 hours of improvised footage, which we edited down to approximately 90 minutes. Then we shot additional footage, this time providing more specific guidelines on exactly what the actors needed to say, in order to clarify certain points that may have been a bit confusing before. One of the biggest challenges in editing was that the cast was so funny, we had a hard time choosing between the jokes and the story. However, through blood, sweat, and tears (well, maybe just tears from laughing so much), we hope our finished product is both humorous and interesting, ready to entertain audiences.